More than "just another business book", this is truly a message of hope for those looking for the opportunity to create their own income security in this period of global economic transition. The 8 Wealth-Building Assets of Network Marketing Robert Kiyosaki believes in the power of network marketing! In his new book, he explains why this is the best time to start your own business and secure your financial future! For the past several years, multimillionaire businessman, entrepreneur, and investor Robert Kiyosaki has been a staunch supporter of network marketing. Like many people, he was skeptical about the industry at first ... until he learned firsthand what network marketing is all about: helping people. 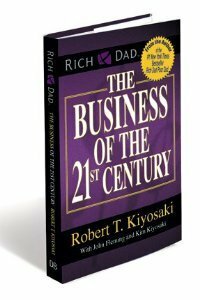 In his latest book, the author of the phenomenally successful Rich Dad Poor Dad series shows why network marketing is indeed the business of the 21st century. Robert shares the eight wealth-building assets offered by network marketing that allow you to take advantage of these tough economic times to build a strong financial future and happier life. John Fleming , the publisher of Direct Selling News, and Kim Kiyosaki, author of Rich Woman: A Book on Investing for Women, join Robert to share their thoughts on why network marketing is the perfect opportunity for both men and women.